Note: HD Wallet add-on users enter their extended public keys in the HD Wallet settings tab instead. CryptoWoo's order processing and exchange rate updates rely on WP-cron, the built-in cronjob service of WordPress. To speed up the payment processing you have to get below the 1 minute granularity of the crontab. You can set up 4 crontasks that are executed every minute and let the 2nd, 3rd, and 4th cronjob sleep for 15, 30, and 45 seconds before they trigger WP cron. This results in a 15 second interval between each WP cron execution instead of one minute when using only one crontask. 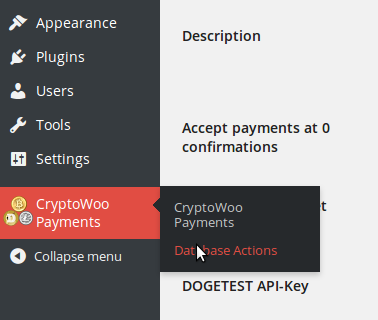 Check the "Database Actions" page in your CryptoWoo admin backend for crontask examples. Done! Your WooCommerce store is now ready to accept digital currencies with CryptoWoo! Please do not hesitate to submit a ticket if you're experiencing any problems!